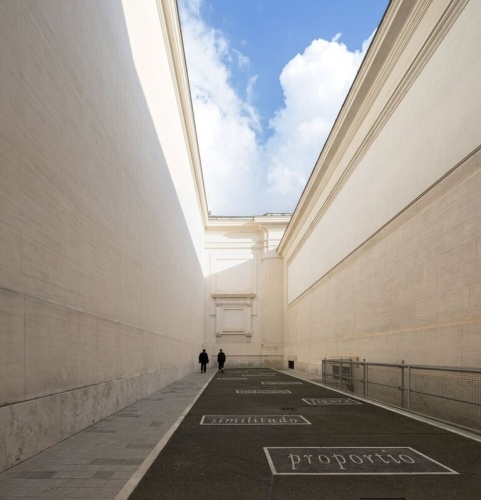 With the inauguration of the great Time is Out of Joint exhibition , Monday 10 October 2016, the National Gallery of Modern and Contemporary Art, directed by Cristiana Collu, writes a new chapter in its history completing the broad process of transformation, reorganization and redevelopment, started on June 21st 2016, with the return to the public of completely renovated spaces and the deep reinterpretation of its collections. The exhibition, whose title cites the verses of William Shakespeare's Hamlet "The time is out of joint", explores the elasticity of the concept of time, a non-linear but stratified time, which seems to implement the dilemma of art historian Hans Belting "the end of art history or the freedom of art". It is the definitive abandonment of any historical linearity, for a vision that unfolds, on a synchronic plane, the works as sediments of the museum's long life: from Giacomo Balla, Gustav Klimt, Lucio Fontana, Alberto Giacometti to Cristina Lucas, Adrian Paci, Sophie Ristelhueber, to name a few. Supported by the special autonomy of the MiBACreform , the National Gallery presents itself as a place of discovery, open to research and contemplation, and a space for reflection on languages, exhibition practices and the role of the contemporary museum.